The new version Microsoft Exchange, Exchange Server 2007, adds a wealth of new features and makes many things easier to do. Unfortunately, installing SSL Certificates isn't really one of them. 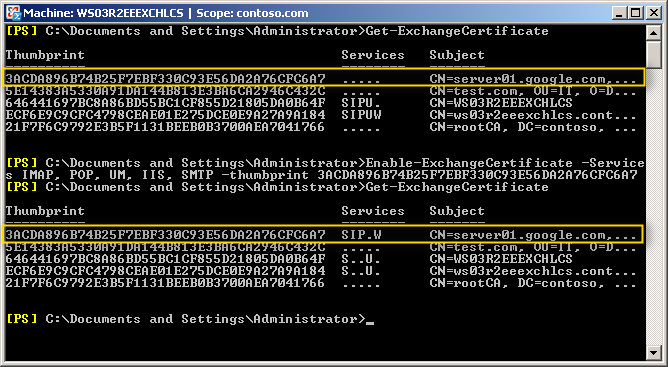 Installing an SSL Certificate in Exchange 2007 requires you to run several commands in the Exchange Management Shell. Don't fret yet! If you carefully following these instructions, you'll have your Exchange 2007 server secured in no time! Unfortunately, you can't just use Ctrl+C and Ctrl+V to copy and paste in the Exchange Management Console. To copy something (like a thumbprint), right-click the shell window and Click Mark. You can then highlight the text that you want to copy and press Enter to copy it. To paste, just right-click and select Paste. 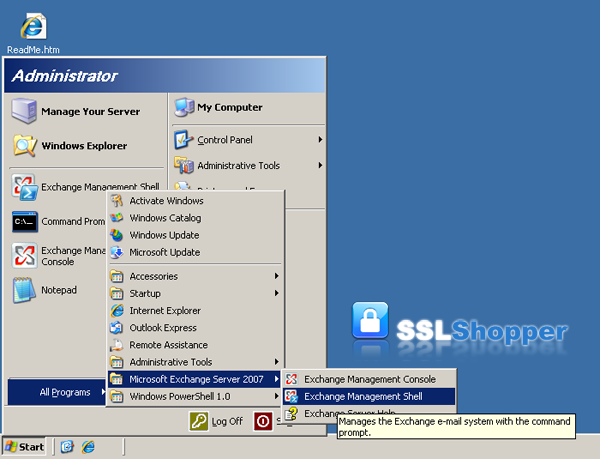 There are several methods of securing your Exchange 2007 server. This article will walk you through the process of ordering a Unified Communications SSL Certificate with multiple domains from a commericial certificate authority and installing it on your Exchange server. Exchange 2007 includes some new features, like Autodiscover, that require multiple names to be secured. There are other methods of securing the additional Exchange 2007 names but the recommended method is to use a Unified Communications Certificate so you only have to worry about one certificate and one IP address. For more information about which names to include see the resources in the Links section below. Once you have determined which names you need to secure you are ready to create a Certificate Signing Request and order the certificate. Can I use a Wildcard certificate? You wouldn't be able to access the server using the internal server name (Server01) because it is not covered by the certificate and you would receive a "name mismatch" error. A wildcard certificate is incompatible with POP3 and IMAP4 on Exchange 2007. See Microsoft's explanation of what certificates to use with Exchange 2007 for more information. Run the New-ExchangeCertificate command below replacing the appropriate values with your own. We recommend using DigiCert's New-ExchangeCertificate Command Generator to get a command that you can just paste in. New-ExchangeCertificate -domainname mail.google.com, google.com, google.local, autodiscover.google.com, server01.google.com, server01 -Friendlyname google.com -generaterequest:$true -keysize 2048 -path c:\certrequest.txt -privatekeyexportable:$true -subjectname "c=US, o=Google Inc., cn=server01.google.com, s=California, l=Mountain View, ou=IT"
-domainname Enter all of the names that you determined you needed to secure in the step above. Organization (o=) The legal name of your organization. This should not be abbreviated and should include suffixes such as Inc, Corp, or LLC. Do not include commas or the command won't work. Google Inc.
Once you have generated a CSR you can use it to order the certificate from a certificate authority. Not all providers offer Unified Communications Certificates, but you can pick one from our list of Unified Communications SSL Certificates or you can compare SSL UC certificates using the SSL Wizard to find one. Once you find the provider that you want to buy from, click the Buy Now button and go through the order process. You will paste in the CSR and provide information about your company so it can be validated. Once the SSL provider validates your order, you will receive your new UC certificate file. Run the Import-ExchangeCertificatecommand below. Make sure to specify the path to the certificate file you downloaded and remove any services that you will not be using. If you didn't receive any errors, then it should have installed correctly. Run the Get-ExchangeCertificatecommand to verify that the certificate is enabled for the correct services. If you aren't sure which thumprint it is, you can view the thumbprint of the certificate you just installed by double-clicking it and looking for the thumbprint on the details tab. If the certificate isn't enabled for the correct services (S=SMTP, I=IMAP, P=POP, U=Unified Messaging, W=Web/IIS) you need to run the Enable-ExchangeCertificatecommand below. You can copy the thumbprint from the output of the Get-ExchangeCertificate command that you just ran. After running the Enable-ExchangeCertificate command, run the Get-ExchangeCertificate command again to verify that the certificate is enabled for the correct services. This step is not necessary if you received a .p7b certificate file from your SSL provider because this file contains all the Intermediate certificates and they are automatically installed. If you received an individual .crt certificate file you may need to follow the instructions in this step. Download the intermediate certificate to a folder on the server. Double click the certificate to open the certificate details. At the bottom of the General tab, click the Install Certificate button to start the certificate import wizard. Click Next. Check the Show physical stores checkbox, then expand the Intermediate Certification Authorities folder, select the Local Computer folder beneath it. Click OK. Click Next, then Finishto finish installing the intermediate certificate. You can verify that the certificate is installed correctly by visiting the site in your web browser using https instead of http or using our SSL Checker.